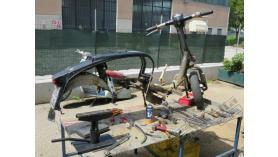 We are currently working on restoring 2 x Italian TV175 Series 3 Lambretta's that are RLC Project scooters. That bascially means that we'll be building 2 show winning 'demo' scooters, to our design that will incorporate all the very best choice parts that RLC, Casa Lambretta and Casa Performance have to offer! On the bodywork front that means all Italian metal bodywork and each one be painted to a design that we're working on now. The parts will all be top drawer and of European origin. Each will have a Casa Performance (CP) hydraulic DOUBLE disc up front, Mupo shockers, CP tubeless wheels, a Dante seat, RLC inside legshield toolbox and some other very choice parts. For the engines, well, there's only one choice and the casings HAVE to be a CasaCase's! These will be fitted with the new SSR250 kits (or the touring SST versions if you so wish?) producing over 45bhp at the rear wheel and bags of torque. The exhausts will be a SSR Protti's, breathing through 38mm carbs and Casatronic ignition to provide the sparks. The gearboxes will be a Cyclone 5 Speed's and a new 7 plate CP clutch will be sitting inside each of the CasaCover engine sidecasings. These motors have a CV of ALL the top parts that will be second to none. These will be two real mental scooters...watch this space.